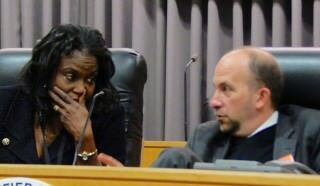 LA Unified Superintendent Michelle King signed off on new health benefits for teachers assistants and playground aides even though the agreement stated that it will help push district reserves into the red by half a billion dollars within two years. And the question in the document asking how the district would replenish those reserves was left blank. According to the agreement, the superintendent acknowledges that the impact of the agreement will cut existing unrestricted reserves in half next year, then result in a $506 million deficit in 2018-2019. The unrestricted reserves meet the state minimum reserve requirement for this school year and next year, but then a “NO” box is checked for the 2018-19 school year. The new health benefits, which will cost the district an additional $16 million a year, was approved unanimously last week without discussion by the school board and helps 4,197 employees who make an average of $28,000 a year pay for their health benefits. The total cost for the certificated and classified salaries is $117 million a year before the agreement. Some of the costs of the health benefits will be absorbed by the state’s Local Control Funding Formula and soften the blow to about $5.7 million a year, according to the Memorandum of Understanding signed between the union and the district. Beginning next school year, teachers assistants who work 800 hours or more a year will get their medical, dental and vision benefits paid for, valued at $506 per month per worker. They will be able to enroll in the Kaiser Permanente plan or a comparable plan. 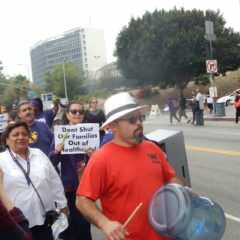 SEIU Local 99 members protest during negotiations over the new health benefits. Playground aides who work 1,000 hours or more a school year will get half of their medical, dental and vision paid for, a benefit of about $253 a month. Family members, who are fully covered in teachers benefits, are not insured by this agreement for these employees. This also does not involve retirement benefits. In the district’s original counter-proposal, the superintendent and school board referred to the findings of the Independent Financial Review Panel, which suggested cutting health benefits and decreasing staff by nearly 10,000. Administrative staff increased this year. It adds, “The district will have to identify additional budget balancing strategies to balance the one-year deficit” of $5.7 million. Michelle King and Steve Zimmer. SEIU Local 99 represents nearly 30,000 employees throughout Southern California in public and non-public organizations in early education, child care, K-12 and community college levels and includes maintenance workers, gardeners, bus drivers, special education assistants, custodians, playground workers and cafeteria workers. Nearly half of the union members are parents or guardians of school-aged children, the union said.